Are you looking for a spicy thali to satisfy your hunger? Drop in at Maharaja, where you can indulge in Kolhapuri-style vegetarian and non-vegetarian thalis and a whole lot more at a very affordable price. The simple restaurant has minimal frill with interiors that are a bit rustic in parts. There are those old-worldly chandeliers hanging around, which look classic. 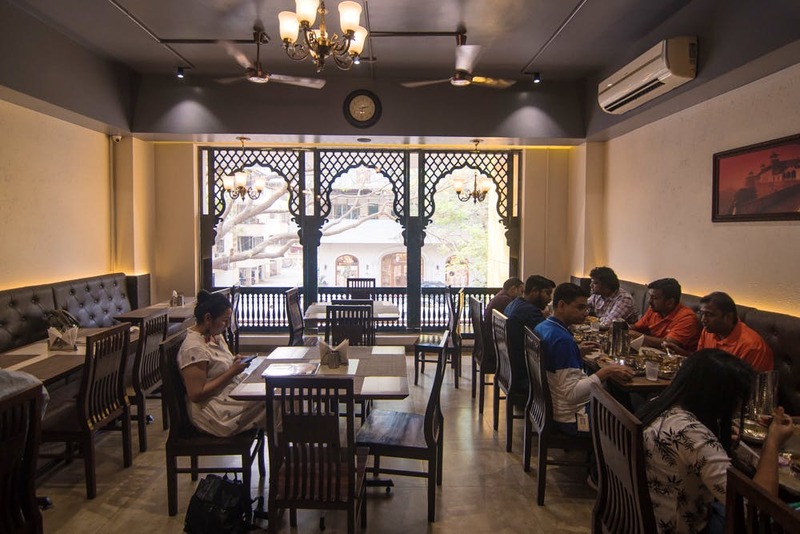 And, the upper seating area has a view of the road out and a wada-like window frame to give the restaurant a very Maratha look. After all, it’s serving delicious Maharashtrian thalis. The menu has your thalis: mutton, chicken, veg. It also offers a mutton and chicken dum biryani. But if thali isn’t what you’d like to fill yourself on, then order form the a la carte. There are your classic Maharashtrian flavours: chicken malwani, keema masala, mutton kolhapuri among others. Vegetarians can opt for gravies like veg kolhapuri, veg maratha, veg malwani among other basic paneer and aloo items. The menu also offers tandoori and Chinese items incase someone may not be in the mood for some spicy, delicious Kolhapuri style of cooking. We started off with hara bhara kebabs, the classic vegetarian kebabs which were flavourful and soft. And later dug into the mutton thali that came with chapati, mutton biryani, pandhra and tambda rassa, and a Kolhapuri-style spicy mutton preparation, where the mutton was cooked to perfection. Vegetarians can opt for the veg thali that comes with two sabzis, dal fry, rice, rotis and a sweet dish. We tried a paneer gravy with naan. A meal for two will cost you INR 600. To drink you can sip on some solkadi, but we insist you eat a thali here. The vegetarian thali is priced at INR 250 and non-vegetarian thalis start at INR 330. We appreciate the restaurant adding North Indian and hakka Chinese dishes to their menu, but we’d love and applaud it more if it stuck to its Kolhapuri-style of cooking. After all, who doesn’t love a dedicated restaurant dishing out what they do best? We’d love to go back for more mutton here because it’s flavourful, cooked well and spicy - just how we like it.